Generation Star Wars: That's no moon. 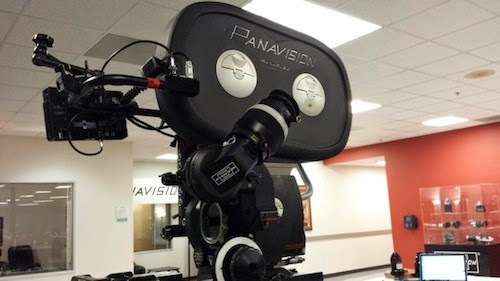 It's a Panavision. Camera operator Andrew Bikichky has posted photos on Twitter of Panavision's 35mm custom-built cameras for Star Wars: Episode VII! The "A" and "B" cameras are codenamed "Death Star" and "Millenium Falcon" respectively. Both will be loaded with Kodak film stock 5219, as revealed by cinematographer Dan Mindel, ASC, BSC last summer. Purportedly Lucasfilm has moved into Pinewood ahead of principal photography in May. Brace yourselves for blacked-out windows and closed set notices.